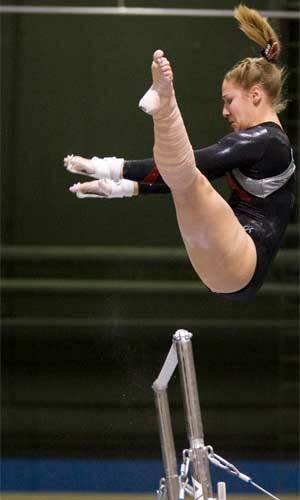 After a slow start to the 2012 season last Sunday in DeKalb versus UIC, the Northern Illinois women’s gymnastics team gets back on the vault, bars, beam and floor Friday night with a dual meet versus Southeast Missouri State in Cape Girardeau, Mo. The multi-camera webcast will also be archived on the KFVS12.com website following the meet. 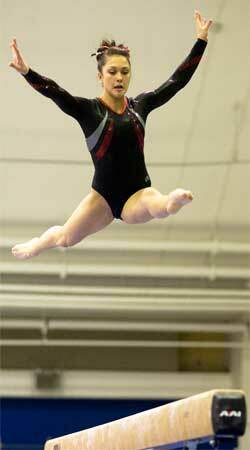 Northern Illinois (0-1) opened the 2012 campaign at home last Sunday with a team score of 188.350. First-year head coach Sam Morreale expects more from the Huskies in their second outing. “I think we had some nerves and tightness in the first meet,” Morreale said. Huskie seniors Shonda Clore (Grand Rapids, Mich./Northview HS) and Tanya Rachan (Lowell, Ind./Hanover Central HS) both claimed event titles in the UIC dual meet with Clore taking first place on uneven parallel bars with a score of 9.800, while Rachan won the balance beam and floor exercise, scoring 9.650 and 9.800, respectively. Northern Illinois goes into the competition versus SEMO with a line-up that features a mixture of veterans and newcomers, with Morreale looking to use the exhibition spots to continue to build depth on the roster. “We want to build off of what we did last week so our line-up will be very similar,” Morreale said. Following the meet at Southeast Missouri State, the Huskies begin a three-meet homestand versus Western Michigan on Sunday, Jan. 22 in the NIU Convocation Center. That meet begins at 2 p.m.
For more information on NIU gymnastics and Huskie athletics, visit www.niuhuskies.com.